Local fishing boats bop in bays fringed with limestone mountains surrounded by beaches and national parks. At sunrise, the boats in the bay light up like soft candles in the distance as fishermen begin their day. 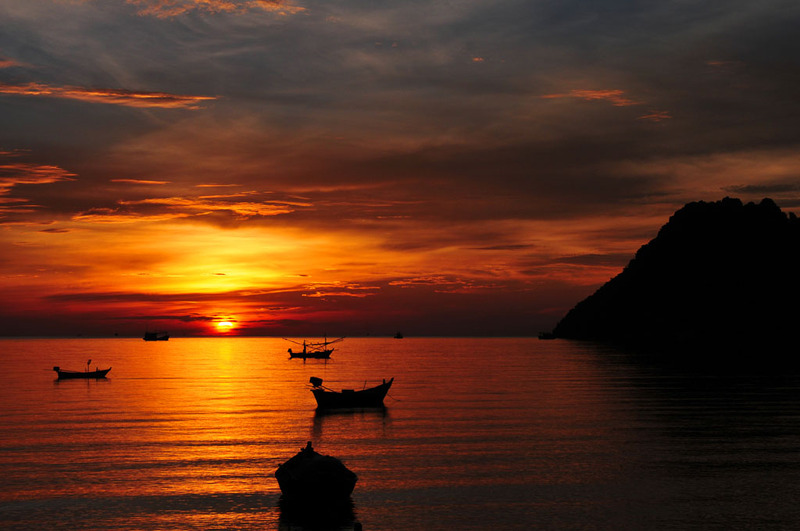 We are in Prachuap Khiri Khan a pretty fishing town by the sea about 240 kilometres south of Bangkok. 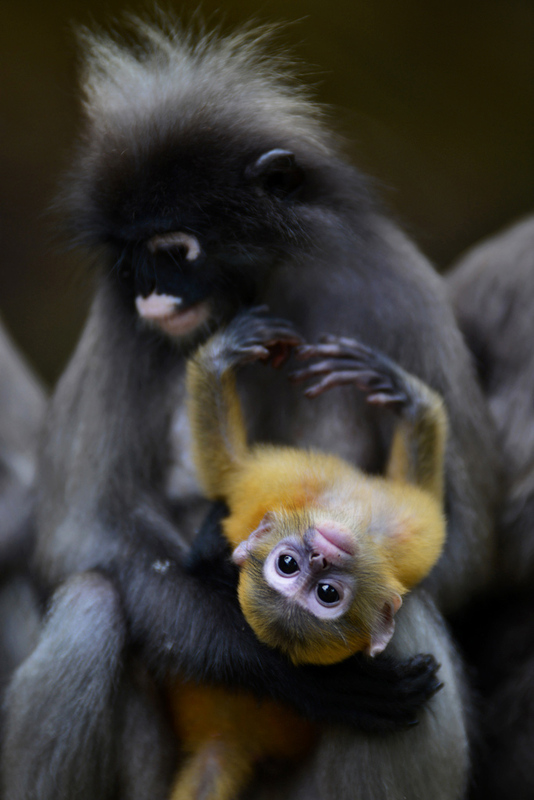 However it is not the sea that has lured us here, but a small colony of cute dusky monkeys that inhabit a nearby beach. 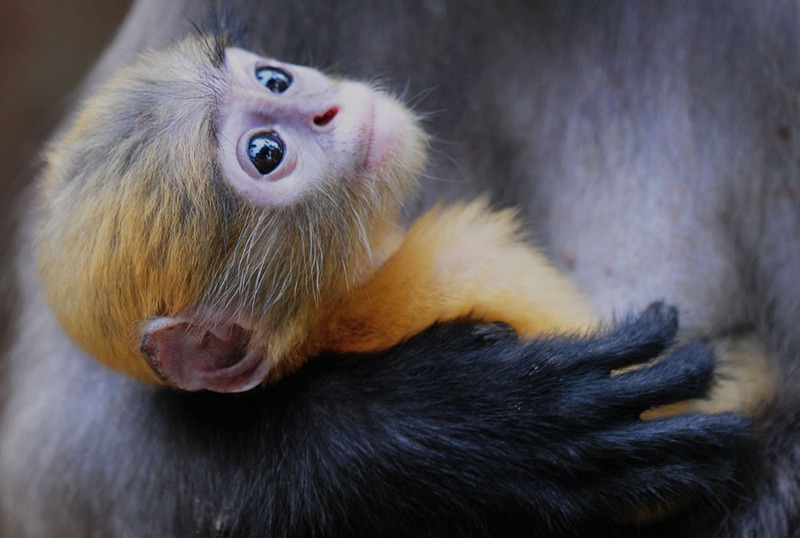 We have always wanted to see these monkeys with the bright orange babies which have to be one of Thailand’s cutest primates. 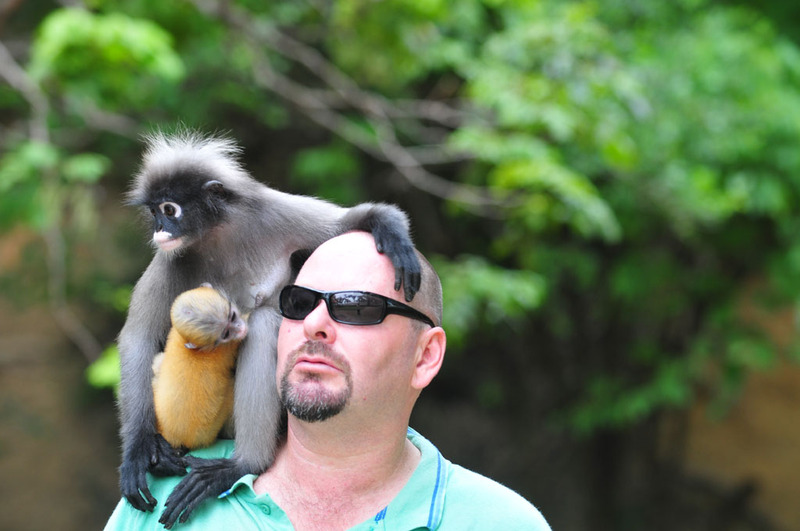 The monkeys live at Ao Manao Beach which is famous for its wild population of them. This is one adorable monkey! 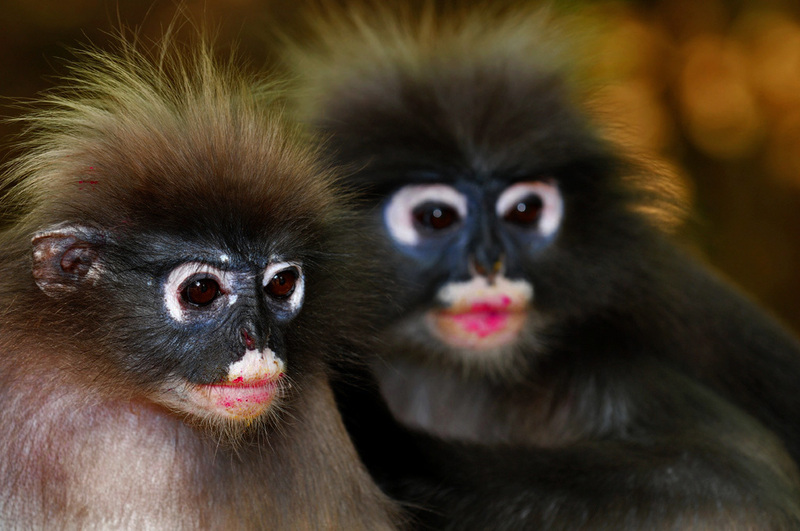 The dusky monkeys are only found in Thailand, Myanmar and Malaysia and considered a threatened species. 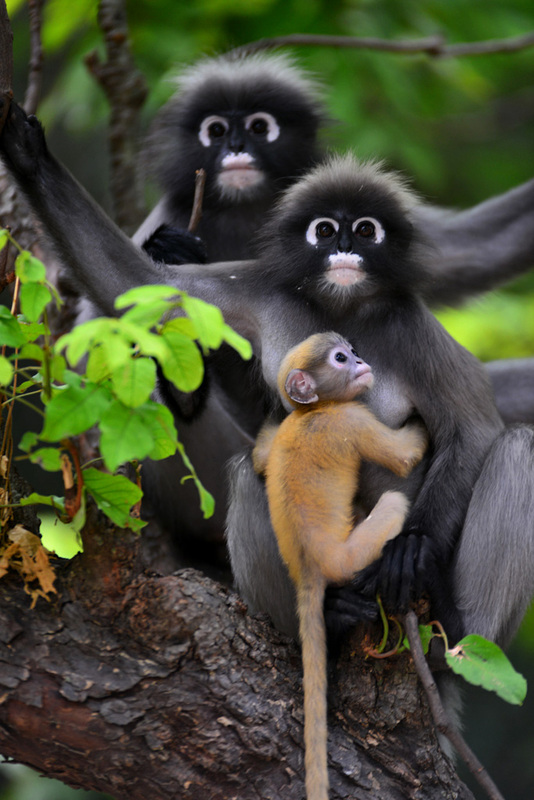 The dusky monkeys are protected by the Thailand government and for this reason, a preservation area was made for them at Ao Manoa Beach. After waking up to the view from our room of one of the prettiest sunrises in Thailand we have breakfast and hire a motorbike from our guesthouse. 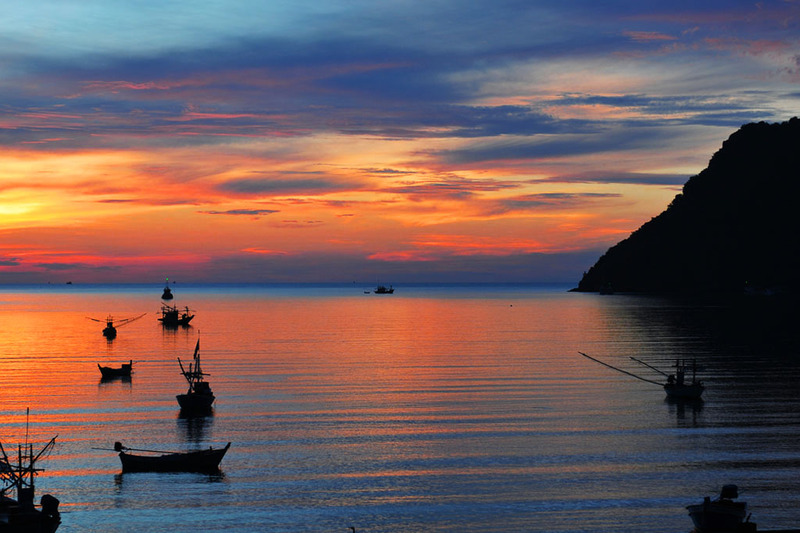 Ao Manao Beach is located inside the Air Force Base which is only about five kilometres out of Prachuap Khiri Khan. 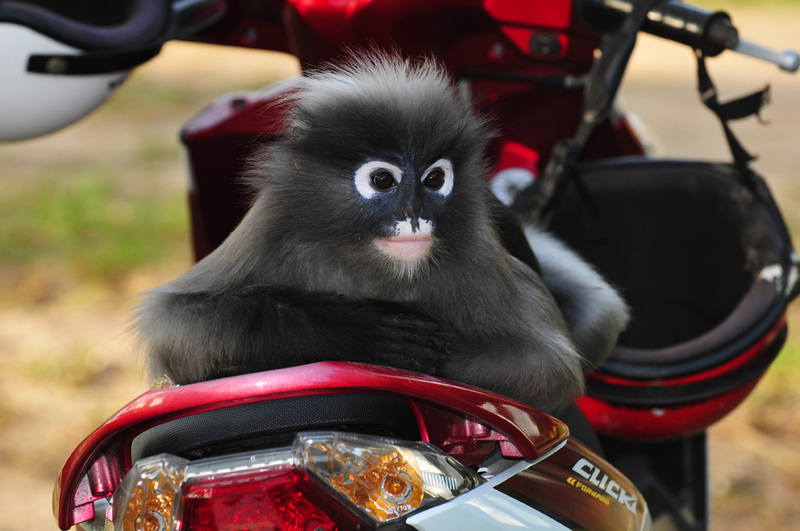 This Dusky Monkey makes himself comfortable on our motorbike. The monkeys live in the sacred mountains but they come down the beach and hang out on a rocky outcrop on the northern end of the beach. The monkeys are wild but habituated and love human company. 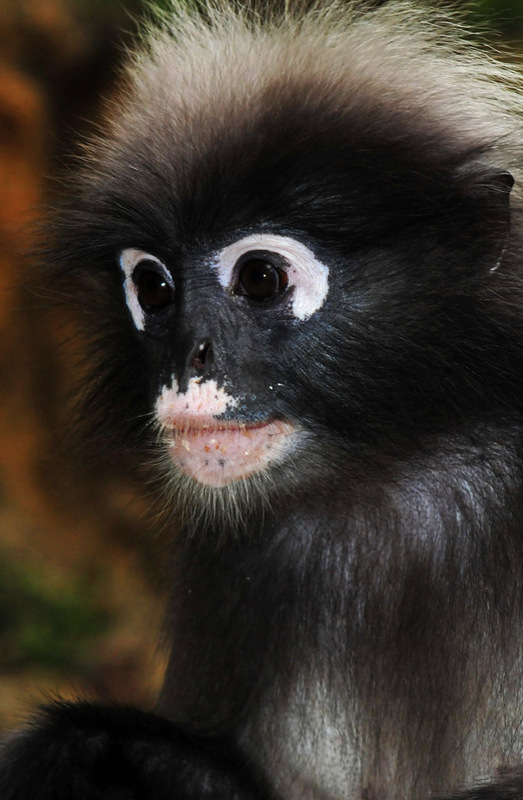 They approach closely and like to touch, but unlike a lot of other monkeys, they are very gentle. 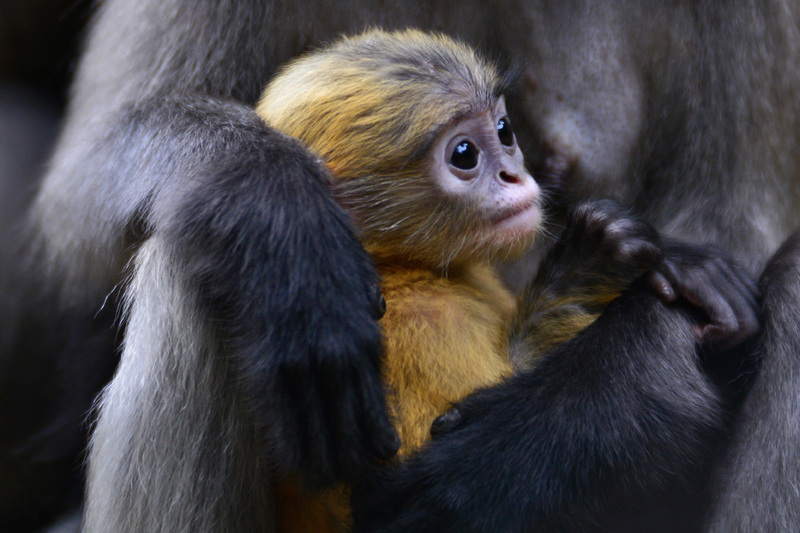 Black arms of the older monkeys encircle fluffy orange babies tight to their chests until the older ones trust us. 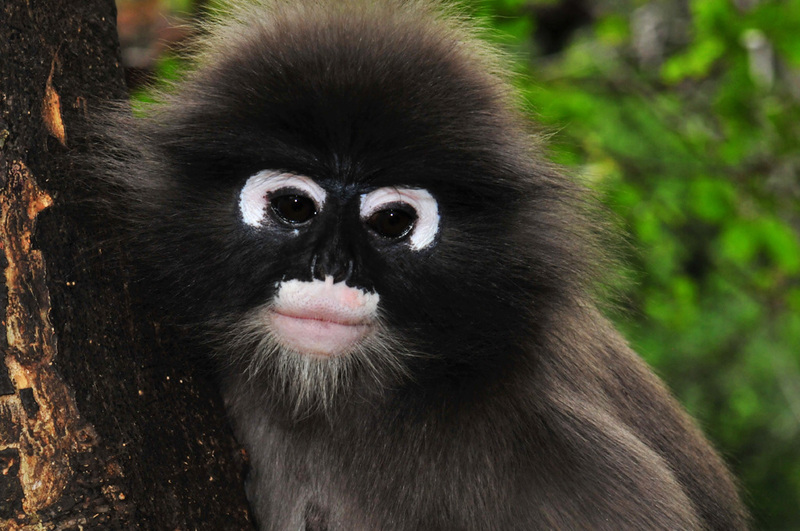 Black or grey fur, a long tail, black human-like hands and feet and vivid white circles around dark treacle eyes makes this one adorable monkey! Very affectionate with each other, they hold hands and hug and tell each other off by pointing a furry black finger rather than aggression. Babies are born bright yellow or orange, and between six and ten months of age, they will start to darken. It is not known why they are born so bright; one theory is they play, wander away, and get lost, and being so bright they are found easily by the adults. The older monkeys pass around and fight over the babies like little rag dolls and even the males want their turn with these orange babies. Smothered with affection, the babies end up looking a little battered and bruised after the rough and tumble love. We spend some time here watching these endangered primates. Their behaviour is endearing, and we have them and this little part of paradise mostly to ourselves. As cute and gentle as they are, they are not beyond thieving, so keep an eye on your belongings. 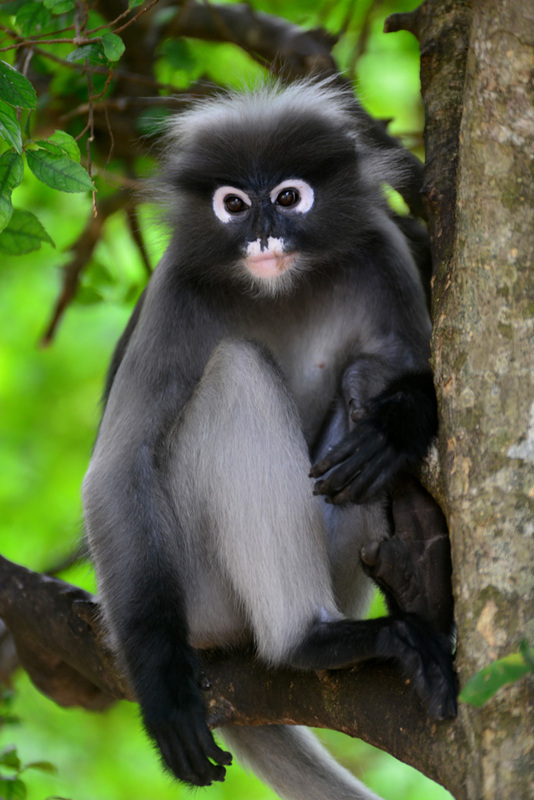 Ao Manao is one of the best places to see a dusky monkey in the wild. A world away from the more popular beaches, Prachuap Khiri Khan is also a nice escape from the touristy crowds and makes a nice stopover while travelling south. Palm trees don’t sway over azure sparkly water and white sandy beaches, but it is laid back and a nice place to relax. On the esplanade, a few local restaurants look over the ocean. If you love seafood, you will be in paradise. We eat at a few local restaurants including a cosy pizza place that makes the best and freshest pizzas, including vegetarian. There isn’t a lot of vegetarian options on the menus but most restaurants will happily create something special for vegetarians. Most local restaurants will prepare vegetarian meals. 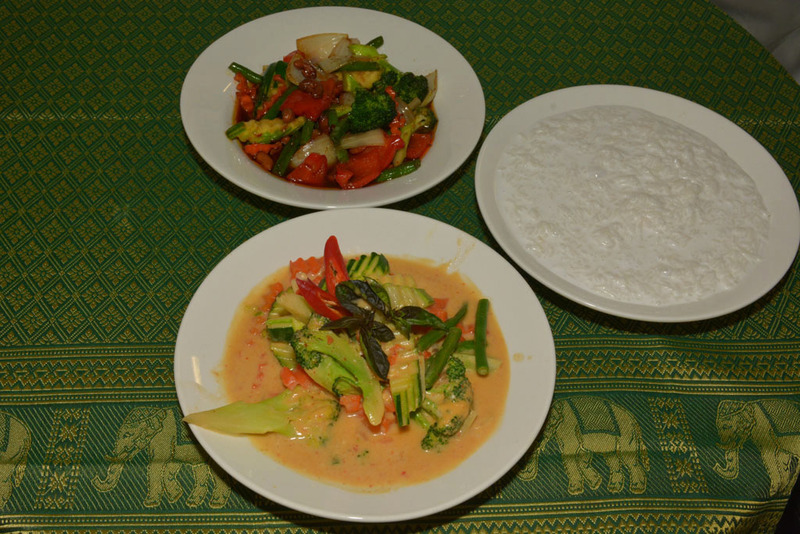 Here we have vegetables in red curry and vegetables with cashews and coconut rice. While here we also visit Khao Sam Roi Yot National Park which takes us about 40 minutes to get to on our motorbike. The scenery of limestone cliffs filled with honeycomb caves is stunning and there is a population of cheeky crab-eating macaques and wild dusky monkeys. Bus or minibus 500 Baht. Minibuses leave every couple of hours from the Victory Monument. Trains depart twice a day from Bangkok 200-400 Baht. Ao Manao Beach is about 5 km from the town centre and takes about an hour to walk or you can go by tuk-tuk or hire a bicycle or motorbike. It is straightforward and easy to find with the map that the hotels hand out. Motorbikes cost about 200 Baht a day. Bicycles are available for 50 Baht a day. The entrance is via the Airforce Base, and you need to register when you enter and depart which sometimes requires your passport. The sheltered water at Ao Manao Beach is clear and remains shallow for a long distance out, which makes it great for families. On the beach, there are cool shady trees, food stalls and umbrellas. We stay at Sunbeach Guesthouse which is pretty, sparkly clean and in a great location as the restaurants are within a few hundred metres along the esplanade. Our room on the top floor has ocean views and we wake up to gorgeous sunrises fringed by limestone cliffs and fishing boats bobbing in the sea. An Ocean view room is 1100 Baht for a night. We wake to this beautiful view. What a beautiful blog! How special! And who would know such unique creatures and out-of-the-way paradises exist without the contribution of people like you two? I have to say that you are both equally special! I have only just discovered this blog, but I will be following it from now on. I am truly impressed. As much by the concise and valuable information as the unbelievable (and obscure) variety of animals you have found and researched. For us couch potatoes to share! Fact. You bring magic into the realm of possibility. Or find it in ways that only the truly gifted can envision and present. Thank you so much for sharing! Your love for these special creatures is so obvious in your writing and the photography is superb! You inspire me to get off the couch and go see! I thank you on behalf of the animals, too. I don’t doubt that your efforts inspire others to join in the fight to save endangered species and their habitats. Well done! My best wishes to your endeavours, always, Marie Bell. Hi Marie thanks for your comment. We are glad we have inspired you! Please don’t hesitate to get in touch with us if you have any questions about this or any of our other trips. That baby monkey is adorable! I didn’t think anything could be cuter than the puppies at the Puppy Bowl, but I have been proven wrong. He looks so sweet, cuddled up with his mother. I have always wanted to go to Thailand but haven’t had the opportunity yet. These pictures are definitely the right motivation, though. Actually, one of my college roommates was from Bangkok and she invited me to visit her. After looking through these pictures, I think I might have to take her up on her offer. It’s definitely time to take advantage of those vacation days. Thanks for the great pictures! Hi Natasha. They really are so adorable! You are guaranteed to see them if you visit as they are humanised. Thailand is a great place to visit whether you want to go off the beaten path or the usual touristy places. If we were you, we would definitely take up your college roommate’s offer. Thanks so much for your comment.